This kit includes a new chipboard ornament set (a simple set of a front piece with a window and a flat back with a scalloped edge — both with a hole for hanging). I designed this year's ornament to have space for decorating (around the edges of the main image you put in the center). 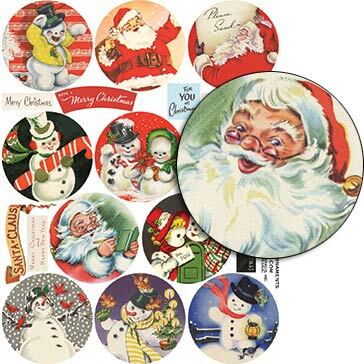 Plus 12 mini papers with zippy Christmas prints, star sequins, ribbons for decorating or hanging AND a new collage sheet with fun images for the center. - TWELVE 6" x 6" double-sided papers — one each of all the patterns in the Vintage Christmas 6x6 Paper Pad. - SIX yards of ribbons — a subset of the 2017 Christmas Ornaments Ribbon Set, chosen for a broad range of colors and widths. - 2.5mm Multicolor Star Sequins (A bunch of tiny stars in a cute little plastic "tin". The lid screws on so you (hopefully) won't end up with stars all over the floor.) Beside using the stars to scatter about for some twinkle, you could also use them to make a "shaker card" by adding a Clear Plastic Round Dome (not included in the kit, but the center window cut in the chipboard ornament frame also fits these domes). All the items in the kit are On Sale, too! Note: there are 3 new related ornament frame sets — more info on them is in the newsletter announcing this kit.